Burnet Road, my nomination for the ugliest street in the universe. 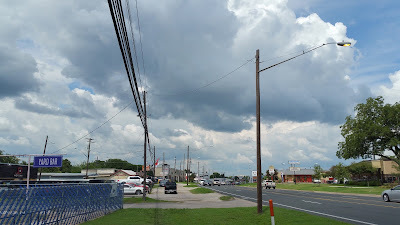 The developing clouds in the north make me wonder if I've chosen a bad day for an outing. To the immediate left is the Yard Bar, a new place without a roof: people buy beer from a small concession stand and drink it at picnic tables. Dogs are allowed, which makes the place ideal for people who love both canines and beer. I'm generally drawn to innovative places, but the economy of beer garden leads me to fear how people will behave when the beer is that cheap. Ichiban was my first stop on this outing, and the journey to here was the longest part of the walk. 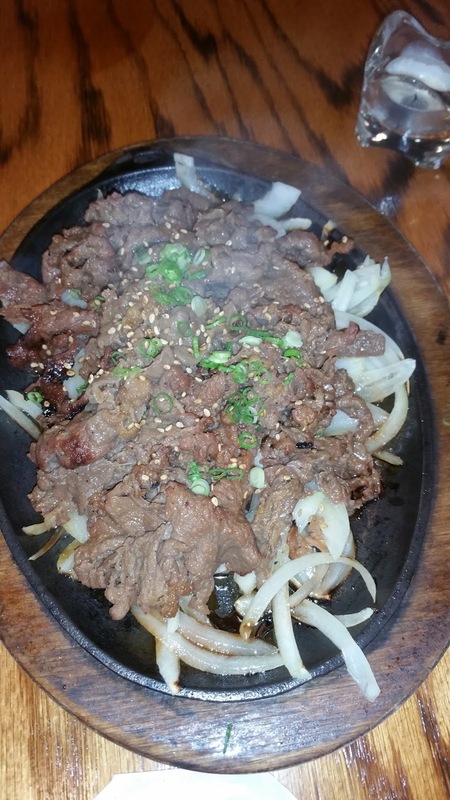 I had just missed the lunch special, but I was in time for happy hour, my waitress told me. Yet I was in no mood to drink. I had massive quantities of both water and iced tea. 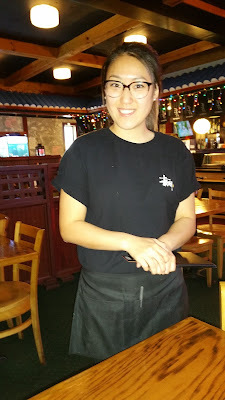 I had my favorite waitress again today. She's a bright conversationalist (but understandably too busy to talk much) and an excellent waitress who knows how to strike that harmonious balance between caring attention and dining distance. 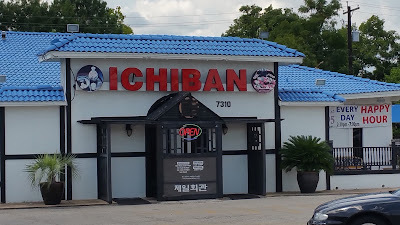 I visited Ichiban in a restaurant search back in April, and I mentioned it in a blog from a day when I needed to eat near the Village Alamo Drafthouse (so I settled on Shabu). I thought I had written about Ichiban on an earlier date and included this picture, but I can't find it. Do you remember? This is a lovely plate of what I call "polite calimari" because they look like onion rings and there are no tentacles visible. I like calimari so much that I'll eat them this way. But I'd much rather eat a plate that looks like this. You can see that the onion rings—which come from the squid's essentially tubular body—but you can also see the tentacles, which reach out beyond the head. The tentacles actually comprise the tastest, sweetest, and most squid-dy-ish part of the squid. If you're not sure about Greek restaurants in your town, find a Greek Orthodox Church. They tend to hold fund-raisers, and they tend to raise lots of funds selling squid. 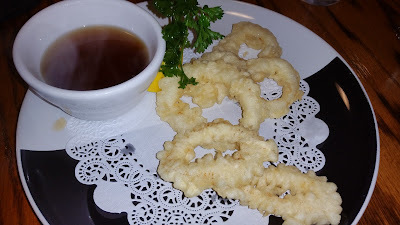 At the fund-raiser in Denver they sold cleaned but otherwise whole squid, breaded in a seasoning mix, and deep-fried, and it was so delicious that I became the calimari lover that I am today. If you can't find a decent Greek restaurant, check for Spanish (as in Spain—there are a Walking Dead's mass of zombies out there who don't know the difference between Mexico and Spain: don't be one of them). Spanish restaurants tend to offer calimari as an appetizer, and they tend to include the tentacles. 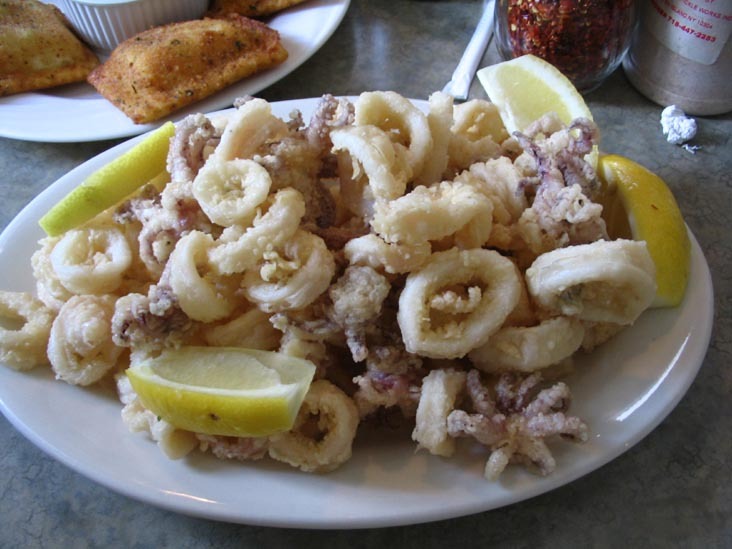 Chain Seafood and Mediterranean restaurants like Red Lobster and Olive Garden, if you ever eat there or get pressured into eating there by your group, will offer calimari as an appetizer, though it will be of the onion ring kind. On the other hand, the appetizer might be designed to share, so it will make a substantial main plate for you, especially if you order it with Olive Garden's bottomless salad bowl. 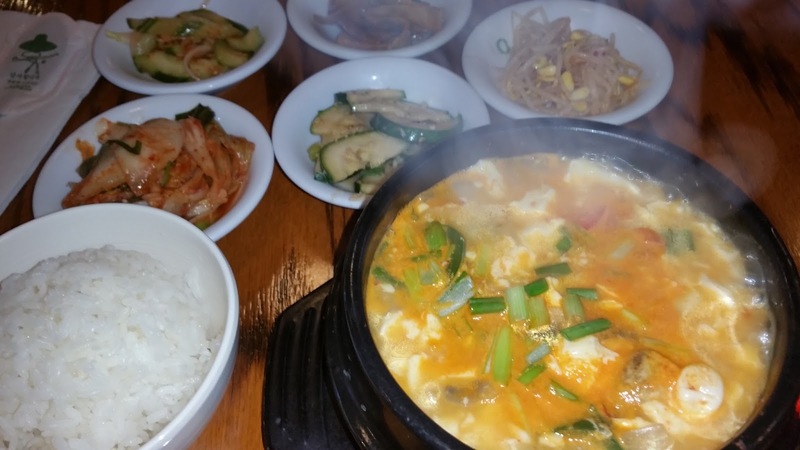 A delicious bowl of tofu and seafood soup (Sundubu jjigae) served bubbling hot in the Korean tradition. On the left is my bowl of steamed rice (bap) and in the background are little bowls of banchan or assorted, usually fermented, Korean veetables, including (in the front row) kimchi, cucumbers, and bean sprouts. This is bulgogi, a sauteed beef dish served on top of a bed of onions. I erred in ordering this much food, though: I was thinking in western terms of the soup as a kind of appetizer before the main course, but in Korea a bowl of soup is a meal in itself. I ate and enjoyed all I could without stuffing myself, but I did leave a lot of the soup and most of those delicious grilled onions untouched. I did find an oyster, like a little buried treasure at the bottom of my Sundubu jjigae. 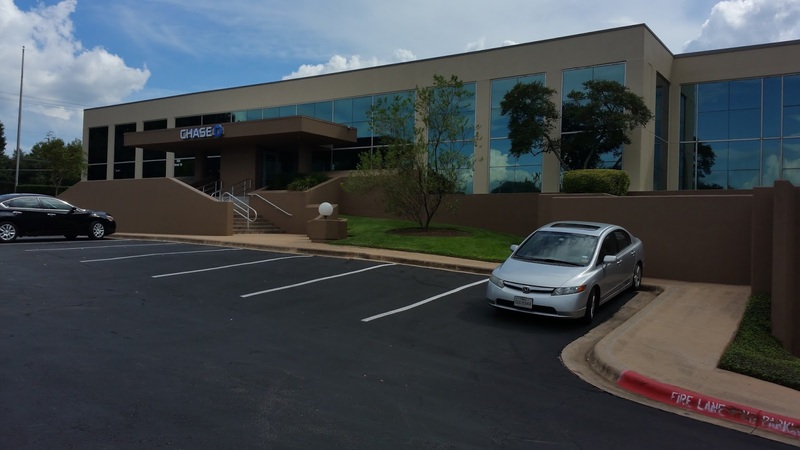 After lunch, I walked two more blocks up Burnet Road to the bank, which was the central item of business in this excursion. After the bank, I cut through what was once Northcross Mall. Now there is a strange office complex and a skating rink there. I take this shortcut not only because it is shorter but also because it is a long stretch of air conditioning in the now bland corridor of what was once an interesting shopping mall. The heat wasn't as bad as it has been—it was only in the 90s instead of the usual 100⁰—but still every possible avoidance of the heat is necessary. In this long corridor through what once was a mall designed to attract people, there are no places to sit. People waiting for classes at the skating rink sit on the corridor floor. There is seating inside the ice skating place, but that's for people who have business in there. Woman with sleeping child in arms watching her young son skate. I wanted to cool off before going into Walmart, so I ducked into Tea Haus for some lemonade. This is a popular spot with Asian students—I imagine that there is some back story there to explain it all. I wonder how I can find out the story. 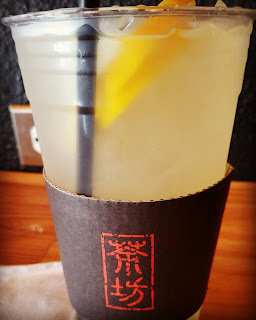 This is the lemonade, which, as lemonade goes, was near perfect: in the words of the singing coach in The Sound of Music, "not too sweet, and not too tart,"
Walmart, usually so full of redneck antics, was tranquil and sparsely populated. One thing that I wanted was curry paste because a fellow G-plusser has impressed me with her chicken curry, so I thought I might try to make some, and I did find a sauce mix, but not before Walmart's selections on the shelves had impressed upon me how they narrowly target a redneck clientele. It turned out there are a few Asian foodstuffs in a fraction of an aisle—much smaller than what HEB has­—but even Bubba eats a Ramen noodle soup now and then. I was really surprised to find the curry mix though. In this Walmart there is a grocery surfing aisle where you can read the overhead signs labelling the contents of each aisle before diving in to find what you need, and along this surfing aisle there are many displays of candy. HEB at least tries to cater to a healthier eating crowd, but Walmart has massive stockpiles of discounted candies in the aisles to appeal to my suicidally addictive impulses for sugar and fats and compulsive eating. So I didn't stay in there very long. I didn't scan the aisles for things that I need or want but that aren't on my list. 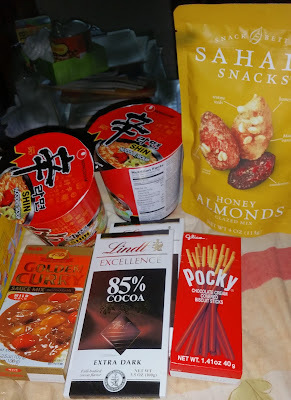 I found the Asian section, grabbed the curry, some soups, and some Pocky sticks, then found some Saran Wrap, which is necessary in my house, and I allowed myself some dark chocolate, which one of my YouTube dietary consultants actually recommends the way others recommend kale and quinoa. At Walmart I discovered that my phone was down to 30% on its battery, and that I had forgotten to bring an extra battery. I was very conservative with what was left of the phone because I use the Capital Metro app to buy a bus pass that will save me from walking all the way back. The Burnet Road bus line now has an express route that keeps me from waiting as long as I usually do for an Austin bus, and when I got on board I told the driver I had to buy a pass on my phone and I'd be right back with him. He was an understanding sort, and the app let me buy the pass, but it would not let me display it. I wrestled and finagled but made no progress, then I realized that my stop was next, so I told him what had happened and showed him what I had, and he nodded and said it was OK. Well, it was the sort of problem that's probably a bug in the app, so I doubt it was the first time he's seen it. This bus stop was right by the HEB, and I decided to go inside and use the restroom and avoid any sort of embarrassing disasters on the way home. And I buy a bottle of Vitamin Water to keep myself hydrated on the relatively short trip home now. It was just a little after 6 pm when I got home—it had been a four-hour trip. After I sat under my ceiling fan, which serves to greatly amplify the air conditioning, I moved to my computer, where I have been ever since, and it's now 12:30. So it took me six hours—50% more time than the trip itself—to write this modest summary. I am not a fast writer.